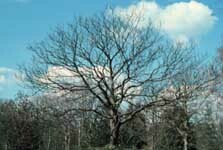 The Southern Catalpa is smaller than the Northern Catalpa and reaches about 30 to 40 feet tall. Leaves are arranged opposite or in whorls (leaves of the Northern Catalpa are opposite) and it has some salt tolerance. A sunny exposure and a well-drained, moist, rich soil are preferred, but they will tolerate a range of soils from acid to calcareous.